Fetal well being can be assessed by a variety of tests including the fetal heart rate (FHR) monitoring. The FHR pattern is assessed with respect to the baseline as well as changes related to various events. It is done in the antenatal period using a non stress test (NST). We present a case in which the NST showed periodic accelerations with fetal movements, the long term variability being maintained during the accelerations. Such a pattern has not been described in the world literature. NST is the most widely used and accepted test of fetal well surveillance that involves electronic fetal monitoring and tracing fetal heart rate patterns over 20 minutes when the patient is not in labor. The baseline FHR is assessed with respect to its value, as well as short term and long term variabilities. Presence of accelerations and decelerations is also noted and analyzed. Various patterns encountered are due to specific physiological and pathological processes. We describe a new pattern in which baseline long term variability was maintained during FHR accelerations. 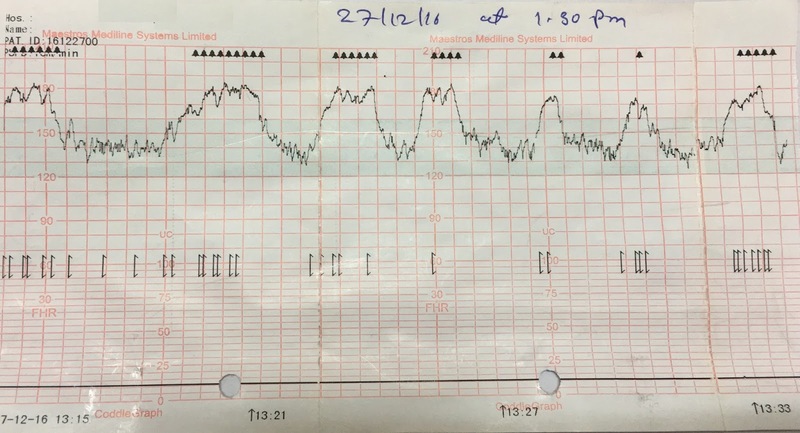 A 31 year old, third gravida first para with a cesarean section and a spontaneous abortion in the past was referred to us at 37 weeks of gestation in view of FHR tracing showing a baseline tachycardia. Patient complained of intermittent minimal pain abdomen only. She was a known case of gestational hypothyroidism on tablet levothyroxine 12.5 micrograms once a day. Her other medical and surgical history was not contributory. On examination her vital parameters were normal, general and systemic examination revealed no abnormality. Obstetric examination showed a full term fetus and vertex presentation. FHR was regular at 150 bpm. 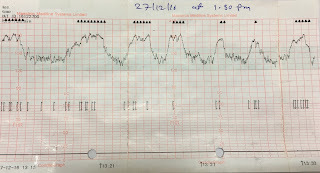 The FHR tracing done by the referring obstetrician is shown in figure 1. It showed baseline FHR of 140 bpm, baseline short term variability of 2-3 bpm, long term variability of 5-10 bpm, and 7 episodes of FHR accelerations up to 180 bpm, each one associated with fetal movements and lasting for 1.5 to 2 minutes. One lasted for 2.5 minutes, associated with continuous fetal movements. There was no baseline tachycardia as was stated in the referral note. The NST was done again at our center, 3.5 hours after the first NST. Its results are shown in figure 2. It showed a baseline FHR of about 130 bpm, short term baseline variability of 2-3 bpm, long term variability of 5-10 bpm, and accelerations with fetal movements reaching 150 bpm, lasting for 0.5 -1 minute. Long term variability was not seen to be maintained during the accelerations. The patient was reassured and sent home. She followed up regularly in the antenatal clinic of the referring doctor and had a cesarean section after 2 weeks for nonprogress of labor, delivering a baby weighing 3.2 kg, with 1 and 5 minute Apgar scores of 9/10. The baby was normal. Figure 1. NST done by referring obstetrician. Figure 2. NST done at our center. Normal fetal heart rate ranges between 110 bpm and 160 bpm. It is not fixed for a given fetus, but keeps changing under the combined effects of sympathetic and parasympathetic activity, arterial baroreceptors and chemoreceptors, circulating levels of catecholamines, and the state of the myocardium and its conducting system. [2,3,4,5] Central stimuli act by sending impulses through direct neuronal pathways to sinoatrial node of the fetal heart and bring about rapid change in FHR. Low pH and oxygen level act through chemoreceptor stimulation and bring about slower changes. Changes in fetal heart rate from one beat to the next are due to the neuronal mechanism, while the long term variation in FHR is due to the chemoreptor mechanism. Fetal breathing and body movements act though the central pathways to medulla oblongata and from there to the sympathetic and parasympathetic systems. Factors which depress fetal central nervous system suppress FHR variability. Sympathetic blockade causes a reduction in long-term variability. [6,7] Parasympathetic blockade causes a reduction in short-term variability. Baseline FHR variability is usually reduced with baseline FHR tachycardia (FHR above 160 bpm). FHR acceleration is a sudden increase in FHR above baseline of at least 15 bpm lasting for at least 15 seconds after 32 weeks of gestation, and of of at least 10 bpm lasting for at least 10 seconds before 32 weeks of gestation. A prolonged acceleration lasts for more than 2 minutes. FHR accelerations are seen with fetal movements, scalp stimulation, and sometimes with uterine contractions. Acceleration of 10 minutes or longer is considered to be a change in the baseline. The short and long term variabilities of FHR are not seen during FHR acceleration. [9,10] An acceleration is an abrupt increase in FHR above baseline with onset to peak of the acceleration less than < 30 seconds and less than 2 minutes in duration. The duration of the acceleration is defined as the time from the initial change in heart rate from the baseline to the time of return to the FHR to baseline. 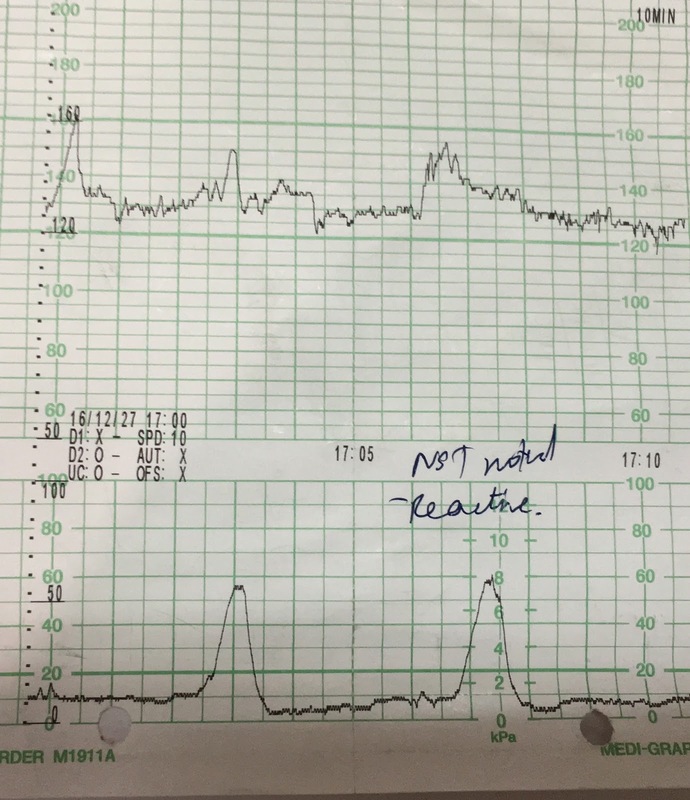 In the case presented, the fetus was quite active, and 7 episodes of repeated fetal movements produced FHR accelerations lasting for up to 2.5 minutes, which was misinterpreted by the referring obstetrician as baseline tachycardia. The fact that the FHR reached the baseline of 130 bpm periodically indicates that it was not baseline tachycardia and was periodic acceleration of FHR. The curious finding in this case was that the long term variability of the baseline FHR was maintained during the accelerations, which is not normally seen. Normally the stimulus that causes FHR accelerations acts on the central neural pathway and produces a strong progressive increase in FHR which overrides long term variation in the baseline. In this case the fetal movements were frequent, and the accelerations in FHR were large and sustained. In spite of that the long term variability persisted, which could not be explained. The pattern was not seen in other women undergoing NST at that center, thereby ruling out machine error. It was also not seen in the same patient at our center, when the machine used was different. The only factor left was the state of the myocardium of the baby, which has its own intrinsic effect on the FHR variability. 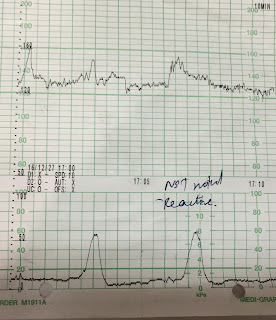 However the interval between the two NSTs was only 3.5 hours, and the fetal myocardium would not show any change of such a magnitude in that interval. The pattern was not due to random mixture of bigger and smaller accelerations related to stronger and weaker fetal movements, because such a relationship does not exist. The Interpretation of FHR patterns is believed to be standardized as all possible types of patterns have been described and analyzed. However we have described a new pattern, which needs further study. Any such occurrences need to be reported so that adequate amount of data can be collected and analyzed. Evertson LR, Gauthier RJ, Schifrin BS, Paul RH Antepartum fetal heart rate testing. I. Evolution of the nonstress test.Am J Obstet Gynecol. 1979 Jan 1;133(1):29-33. Renou P, Warwick N, Wood C :Autonomic control of fetal heart rate. Am J Obstet Gynecol 1969;105:949. Gagnon R, Campbell K, Hunse C, Patrick J Patterns of human fetal heart rate accelerations from 26 weeks to term. Am J Obstet Gynecol. 1987 Sep;157(3):743-8. Electronic fetal heart rate monitoring: research guidelines for interpretation. National Institute of Child Health and Human Development Research Planning Workshop. Am J Obstet Gynecol. 1997 Dec;177(6):1385-90. Paul RH, Suidan AK, Yeh S, Schifrin BS, Hon EH Clinical fetal monitoring. VII. The evaluation and significance of intrapartum baseline FHR variability. Am J Obstet Gynecol. 1975 Sep 15;123(2):206-10. Dalton KJ, Dawes GS, Patrick JE. The autonomic nervous system and fetal heart rate variability. Am J Obstet Gynecol. 1983 Jun 15;146(4):456-62. American College of Obstetricians and Gynecologists. ACOG Practice Bulletin No. 106: Intrapartum fetal heart rate monitoring: nomenclature, interpretation, and general management principles. Obstet Gynecol. 2009;114(1):192-202. Macones GA, Hankins GD, Spong CY, Hauth J, Moore T. The 2008 National Institute of Child Health and Human Development workshop report on electronic fetal monitoring: update on definitions, interpretation, and research guidelines. Obstet Gynecol 2008;112(3):661-666.